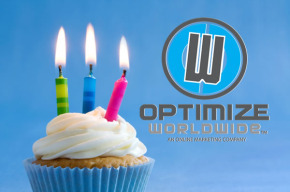 Today marks the third birthday for local Redding website design and online marketing company Optimize Worldwide. Starting as a two-person operation run only by CEO/Founder Matt Morgan and one other employee, Optimize has grown significantly in the past three years and now currently employs seven talented people that include Lead Web Designer Benjamin Briceno, Account Executive Melissa Miller, Web Developer Tyler Shuster, Copywriter and Social Media Manager Gina Ponce, Graphics and Advertising Expert Jesse Moffett and Communications Manager Heather Harris, who all reside in the immediate area. Aside from being able to enhance the community’s economic growth by supplying jobs to its residents, we are also proud to be making headlines as a business that supports other regional organizations by volunteering our expertise and services to benefit their cause. Most recently, we had a hand in developing new websites for the Redding Police Department and Redding Crime Watch. You may also recognize Matt from being featured in the Record Searchlight’s Business Spotlight section in 2012 as well as from all his community involvement (Downtown Redding Business Association, Shasta Leads Club, Leadership Redding, Redding Dirt Riders Association). Although, Optimize loves working with and promoting local enterprises, we don’t stop there. Forty percent of our clients actually come from businesses outside of Redding and span across the nation. We are able to stay up-to-date on all the latest web development technology and online marketing strategies right from our home base of Redding without ever missing a beat. We were honored to win the Best of Redding Award for 2013 and be nominated for this year’s Best Company to Work For in Shasta County. We are excited to continue on this journey with the team we have built and all the existing and future clients we have the opportunity to work with.